View More In Wallet Cases. 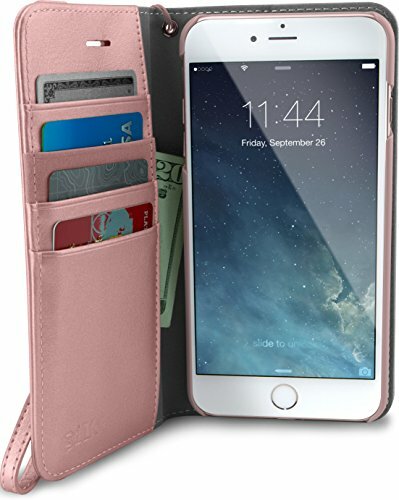 The Folio Wallet Case for iPhone 7 Plus by Silk is a slim portfolio card case that provides convenience, simplicity, and security. The Folio features a durable soft-touch cover and contoured fit that provide full-frame protection for every surface of your iPhone. An elastic security strap assures your essentials stay cradled, and the integrated Easy Fold Kickstand allows for hands-free use. The Folio’s soft-touch outer design provides the perfect amount of grip while still allowing the case to slide in and out of pockets with ease. The Folio Wallet Case holds 4 cards plus cash, effortlessly merging the necessities of your wallet to the form factor of your iPhone 7 Plus. WIRELESS CHARGING COMPATIBLE - Charges through the case. Nikola Tesla approved! FOLDING KICKSTAND - Props up phone to watch videos. Netflix & chill? If you have any questions about this product by Silk, contact us by completing and submitting the form below. If you are looking for a specif part number, please include it with your message.